During the course of several conventions this year I’ve been commissioned by fan Ari Shapiro to create illustrations of the classic JLA (before the disbanding wherein the main characters were replaced by Vixen, Vibe, Steel and Gypsy, etc.) I finished the final commission at the Miami show so now’s the time to reveal them all on my Facebook page. While some have appeared here before, a few are making their Facebook debut. I hope you enjoy them as much as Ari seemed to. Below is the gorgeous Firestorm sketch from this collection! Wow, what a drawing! 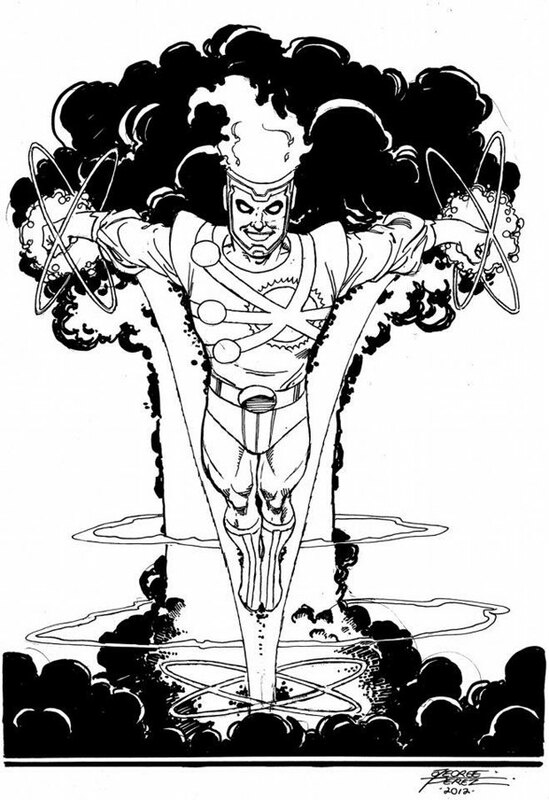 George Perez draws one of the most recognizable Firestorms out there! After co-creator Al Milgrom’s run on Firestorm volume I, George Perez was essentially the next regular artist for Firestorm (first on the Firestorm back-up stories in Flash, then on Justice League of America). Check out all the fantastic sketches in, “JLA: the Shapiro Collection” by clicking here. My thanks to Match-heads Keith G. Baker and Eric Sellers for the heads-up on this sketch! Posted in: Firestorm #01: Original (Ronnie/Martin), George Perez, Justice League of America, Sketch/Art. That is soooo Perez – he’s good at “actual joy” in character faces. I was thinking something similiar, that it was the first time I’ve seen a “happy” Firestorm in a while. I would love to get a Perez sketch at a convention one day, but I’ve heard the line for his work is miles long….and rightfully so, the man is amazing. On a side note, this seems like the busiest week for comments on this site in a long time. That looks so damn good! Makes me crave the Firestorm of yester-year! Perez is still one of the best in the buisiness! I still love his work over Jim Lee’s! And im a huge Jim Lee fan! I checked out the rest of the sketches, love them all! My only issue is with his Batman sketch, which is a fine sketch, I just hate the Bat symbol without the Yellow oval behind it! Never been a big fan of the giant black symbol on its own. Its one of those Alex Ross influences I havnt liked at all.